You had been living an ordinary, run-of-the-mill existence that was ball-and-chained either by submitting to the safe, well-meaning expectations of others or yielding to weak, limited expectations of yourself, or both, and you could sense a discord growing within. You were pursuing an easy major in college or slogging through a cog-in-the-wheel job, living center-mass on the path of least resistance. You have since looked yourself in the mirror and chosen to disrupt the situation, to break away, to not only start a new chapter but to throw out the old book and start an altogether new one. You are choosing to be uncommon. What now? Mark, you have succeeded not only in doing ordinary things uncommonly well, but have also done extraordinary things extraordinarily well. I submit that this statement is a good definition for what an uncommon life demands. It includes an 8-word mandate on how to rise up and become special: Doing both ordinary and extraordinary things extraordinarily well. Start with the common things—like making your bed in the morning (a nod to Admiral Will McRaven’s commencement address at the University of Texas) and conversing with your team. Strive to do simple tasks like these uncommonly well. The next step is to actively seek out extraordinary challenges. I’m talking about crucibles, events that spark a powerful self-inquiry of the warrior way. Commit to these extraordinary challenges by preparing and executing them extraordinarily well. This simple formula will pay big dividends. It is not, however, for the faint of heart. You must summon the courage to question your stories and do the digging to reveal and tap into the unique source of what is guiding your life. Guess what? This is an extraordinary challenge. As discussed in last week’s blog, such work requires that we slow down and find a place of silence. Patience is also requisite in order to tune into the whispered frequency of this inner voice. As we do this we must be prepared with an open courage to admit that the current story, the narrative that you once bought into lock, stock and barrel, may no longer be serving you. You ask, ‘What if I am completely missing the boat on fulfilling my purpose in life?’ It’s in a state of silence and patience that this question can lift open a new, profound space for self-examination, offering hard, honest answers and self-awareness. Here’s the good news: Once you lock into this inner wisdom, it will inform you of a grand purpose. A grand purpose that is your birthright. More news: This grand purpose won’t let you go, ever, until you acknowledge and align with it. It is going to haunt you. It will haunt you in small, seemingly inconsequential ways at first, like muted taps on the shoulder, gradually building until you will be incapable of thinking of anything else. In effect you will be driven toward a new 20X journey where you pursue a whole version of yourself, a version worthy of fulfilling this new vision burning inside of you. You must then find a way of life that aligns with this vision in a meaningful, practical way. Your life depends on it. A new life that is worth living for and dying for. Welcome to the Way of the SEAL. What if you sense this purpose and can hear the inner voice, but you’re not ready to make the leap into the abyss of the unknown? Or maybe you are still uncertain of whether it is your “true inner vision” but yet another incomplete or even false story? You must hit this challenge head on by stoking your inner vision daily through visualization practice in your Mind Gym. The following story will illuminate the subject. Recently a fellow named Jake attended the SEALFIT SOF Academy. He was an active Marine who had been on a two-year journey to become a SEAL. Jake was fairly certain that his purpose was to serve his country in the capacity of an elite special operations warrior. However, when he slowed down and spent time in silence, listening inward and opening himself to an articulation of his purpose, he suddenly broke through into a deeper well of awareness and self-realization. Jake understood that he was not meant to be a SEAL, serving his country, but rather a “Sheepdog for all of Humanity.” He was expressing a newfound sense of consciousness that put all of humanity above the tribe. He was not saying he didn’t support his “American Tribe.” Rather, as an American, he was blessed with the opportunity and resources to serve all of humanity in a manner even more meaningful to him. This insight was flowing from a new place, one not tethered to his ego or limited self. It was coming from a spiritual place, his “True Self” that was witness to his life. In essence, Jake had become a “world-centric warrior,” a subject I will be writing about in the future. What an example of a transformation and validation of the power of uncovering purpose and igniting passion. 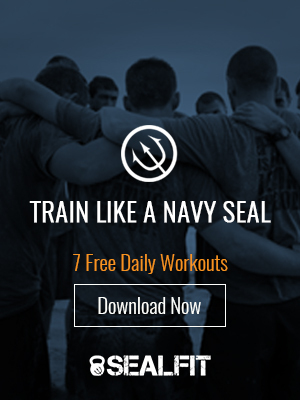 Can Navy SEALs lead the way in cultivating world-centric warriors who serve BOTH their country AND all of humanity? I think so. However, there’s a stark reality involved. Though Jake is profoundly moved by his experience and shift in consciousness, he still doesn’t know exactly how this newfound vision will unfold. The pureness of his intention is vivid, but the path remains hidden to him. So now, in addition to his other training and practices, he is stoking his inner vision through daily visits to his Mind Gym. Patiently he is watching and nurturing the vision through visualization and investigating avenues of how he may align with this new purpose. Slowly, almost imperceptibly, a path is sharpening into focus. This is the process of stoking an inner vision. In doing so Jake is also polishing the mirror of his ego mind so that he can walk the path with integrity and honor when the time comes to take action. What my friend Marc Gafni calls his “True Self” is combining with Jake’s perspective-forming “Ego Self” to allow his “Unique Self” to flourish! (Incidentally for those who enjoy reading books on spirituality and enlightenment I recommend Marc’s important book on the subject titled: The Unique Self: The Radical Path to Personal Enlightenment). To sum it up, choose to be special, do the extraordinary things well, uncover your purpose and ignite your passion, and stoke your emergent, evolutionary inner vision. The next stage is to set out upon the path that opens up to you and live it with honor, taking a stand. That is the subject of the next post in this series on Daring to be Special.